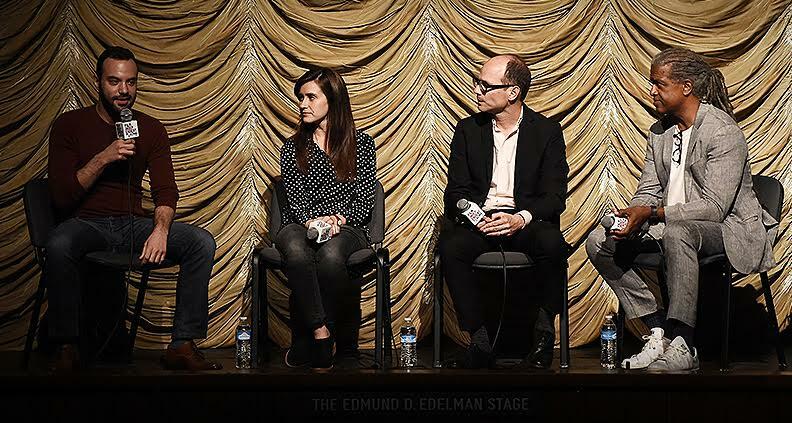 On October 5, filmmakers Elaine McMillion Sheldon and Jacob LaMendola screened their short documentaries Heroin(e) and Long Shot at LACMA’s Bing Theater, following an insightful conversation moderated by Film Independent at LACMA curator Elvis Mitchell. The panel also included Netflix executive Jason Spingarn-Koff—formerly of The New York Times “Op-Docs” series—who was instrumental in bringing the two acclaimed nonfiction shorts to the streaming giant. Sheldon’s Heroin(e) follows three brave Huntington, WV women working tirelessly to save the lives of opioid abusers. LaMendola’s Long Shot follows a young Latino man wrongfully accused of murder, who—with the help of a zealous attorney—goes to great lengths to prove his innocence, which beautifully (and even comically) points to an inadvertent appearance on an episode of Larry David’s Curb Your Enthusiasm. Both films tackle serious subjects and important social issues, relying on emotion and hope and the theme of not giving up. Sound interesting? Well, both films are available to stream on Netflix right now. The issue hit home for Sheldon—literally. “It’s not a distant issue for us,” she said. “We live in West Virginia. We’re from there. It’s not just their problem, you see it all across the country.” She noted that while the media has covered the opioid crisis adequately, for the filmmaker herself, “If I have friends that are caught up in this, whether they have died from it or are imprisoned for it, I need some hope and to understand how we’re going to get ourselves out of this.” Sheldon credits the three women spotlighted in the film, adding that if not for them a greater number of people would be enwrapped in the opioid epidemic. “They provided that hope I’m in need of, as a resident of this state,” she said. Sheldon revealed to the audience that during one of the very first interview scenes of Jan Rader, she had to dash away in a fire truck to go save a life. But Rader does more than save lives. She stays in contact with those in recovery and cares for their well being, still receiving messages from people who are 10 years clean. “Jan is trying to lead a different wave of how we treat people,” said Sheldon, noting that despite the doom and gloom of the subject, the impact her subjects have made is tremendous. In the case of Long Shot, filmmaker Jacob LaMendola shared how the project originated. “I wish this was a more exciting answer,” he began, “But I found it on the IMDB trivia page for Curb Your Enthusiasm.” Pretty exciting, if you ask me! Long Shot engages viewers from the start, as Juan Catalan divulges the details of his case in clean, crisp close-ups of his “great open face” (as Mitchell noted). Viewers sense the deep sadness in Catalan’s voice and see his sincere emotion. Simply put, he’s a beautiful storyteller. “The way he said it—that for me was the heart of the film,” LaMendola said, speaking to Catalan’s ability to place viewers at locales as diverse as Dodger Stadium or the inside of a courtroom. Mitchell observed that Long Shot is very much a character-driven piece. LaMendola was able to craft the film’s narrative and narrow its focus by honing in on the people he felt were the best storytellers. “If [certain] characters didn’t come directly into Juan’s orbit, they felt out of place. It felt like cheating, or information that wasn’t supposed to be there,” he said. In the end, the film balances emotional scenes with humor at key moments. The film features Larry David himself, as archived Curb Your Enthusiasm footage eventually becomes the alibi that sets Catalan free (with the help of brilliant Melnik, of course). After the lights went up, LaMendola informed the audience that Catalan and Melnik were actually in the audience. There wasn’t a dry eye in the room as the pair embraced and looked to the audience appreciatively in a beautiful, emotional, perfectly unforgettable moment. Both Heroin(e) and Long Shot address specific social issues with hope as the focal point and the message to keep going. In the Q&A portion of the night, executive producer Jason Spingarn-Koff said a word about the place of docu-shorts at Netflix. “There’s a renaissance of short filmmaking right now. These films were just so special—they really add something to the initiative for [Netflix’s] original documentaries.” It’s hugely encouraging that Netflix has created a space for short films and global audiences now have access to these powerful stories. Heroin(e) and Long Shot are both currently streaming on Netflix. To see what’s coming up at Film Independent at LACMA, click here. And learn how to become a Member of Film Independent by clicking here. Not a Member of Film Independent yet? Become one today.